DIY stair building? No problem. Our balusters screws are steel dowel screws which will enhance the strength of your most beloved balustrade. They are definitely stronger than the traditional dowels and they�re easier to install. 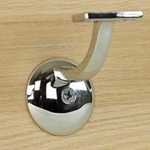 Another good thing about our balusters screws is that they also provide a cleaner and more polished look as the actual screws are hidden and there are no holes, no gaps and no visible cuts. At the end of the day, you get a stronger balustrade�plus a good looking one to boot. Newels provide the majority of the structural integrity in any balustrade system. We offer 7 different newel mount kits so your installer has access to the best hardware for your specific field conditions, and each kit comes with an illustrated instruction sheet. If the framing carpenters remembered to provide blocking in the right places, you�re in good shape. But we didn�t stop there! Unsupported wood sub floor, solid wood stair treads or concrete slab, we�ve got your hardware. What�s more, you can coordinate the design of your stair parts because the details will all be covered. Our hardware accessories come in plenty of designs, all which come in the best quality and in the best variety. We will also be glad to assist you in picking the right accessories. At Stair Warehouse, you�ve got everything that you need. Classic two-story homes are never seen without a simple or grand staircase to allow transportation from one floor to another. Indeed, this structure has been a source of pride among homeowners since these stairs have become a focal point for art and architecture. The hardware of every staircase is considered carefully to suit the kind of architectural design you would want to appear in your staircase later. The stair hardware will depend on the size of the house, the allowable cost and of course the preference of the owner. Although most homeowners would prefer to remain traditional and stick to wooden stairways, more and more architects are learning to convince their clients to use stainless steel for the stairways. Stainless steel is more durable than wooden materials. It is resistant to rust, corrosion and stain so that the stairways may retain its original appearance and still look new even after a number of years. Moreover, it is definitely resistant to termite so you will not have problems regarding termites infesting your homes. In addition, this type of material is much cheaper so it is definitely cost-effective. While stainless steel may be more durable and more cost-effective, wooden stair parts still offer an old-fashioned and elegant appeal that will surely amaze guests and visitors. Take your visitors to a trip to the olden times with your timeless staircase and earn their heartfelt praises and admirations. Whatever hardware is used in building the staircase, the most important notion to consider is still the safety of the occupants and those who will walk up and down the stairs. So choose your stair materials carefully. We have a few sections to help you find what you're looking for. 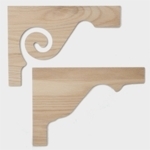 We have Wall Rail Brackets, Rosettes, Stair Brackets, Wood Plugs, Newel Fasteners and Baluster Fasteners, and our Stair Remodel Tools.